Groundwater is a valuable resource, and regulations are needed to conserve and protect it. In the UK, groundwater can generally be freely used for purely domestic purposes, with the quality checked by local Environmental Health Officers. In most of England and Wales abstracting groundwater for non-domestic use requires a license to be issued by the Environment Agency, who will check that the proposed pumping will not harm the environment or cause other users’ boreholes to dry. In Scotland and Northern Ireland similar controls are being introduced. 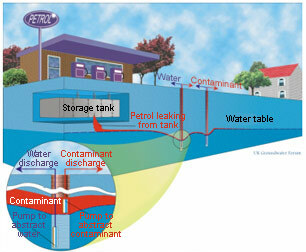 Some aquifers are naturally protected against pollution by being covered with impermeable soil or rock, but where this is not the case aquifers can be polluted if chemicals are applied to the land surface over the aquifer (e.g. pesticides), or if they leak into the aquifer by accident. To protect these aquifers several approaches are taken. The first of these is to map where groundwater is most vulnerable and to use this information when giving planning permission for activities that are potentially polluting. For large public groundwater supplies, the areas of land from which water flows is also mapped, and activities that might cause pollution are carefully controlled. These areas are called ‘Source Protection Zones’. There are also special measures aimed at controlling nitrate pollution of aquifers including controls on farming practices. Where industrial activities or waste sites might pose a risk to groundwater they are regulated to reduce the risk of accident, and special boreholes are drilled and monitored, so that any pollution can be picked up early. If pollution does occur there are ways it can be controlled, for instance by pumping around the source of pollution and treating the contaminated water.